Prior to his notable presence as the spiritual figurehead and founding member of the funky, folky Fugs, Tuli Kupferberg gained indirect notoriety as the real life "guy who jumped off of the Brooklyn Bridge and lived," immortalized in Allen Ginsberg's epic "Howl". 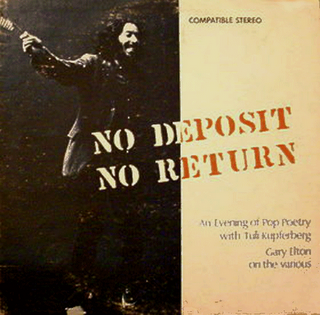 "No Deposit, No Return" is Kupferberg's out-of-print 1966 spoken-word solo debut. Now there´s a fresh link. Best wishes!